The Silver Inn, long gone, was a restaurant for less than a decade. 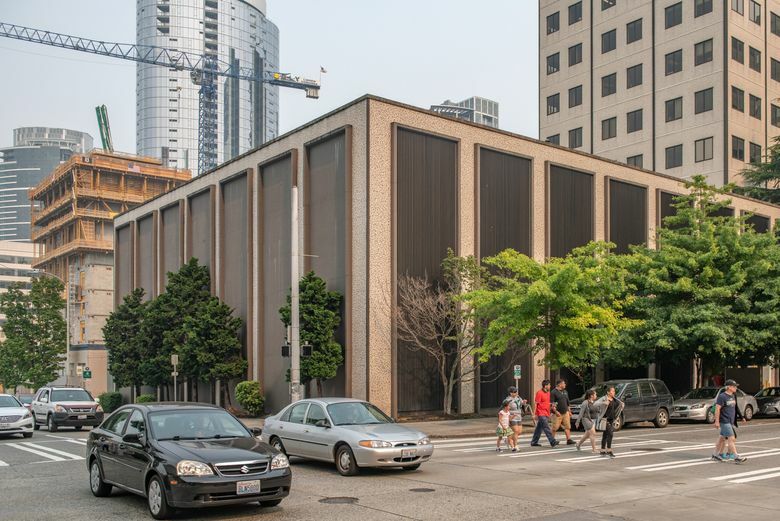 Now it’s the site of the Denny Building’s parking garage. THE ADDRESS “S.E. Cor. 6th & Bell St.,” scrawled on the driveway of our “Then” photo, might alert you that this is yet another King County tax photo, one of the few thousand rescued by Stan Unger from the assessor’s office’s trash nearly a half-century ago. When Jean Sherrard and I are through scanning and using a selection of them, usually for this column, we put them in an archival box tied with blue ribbons and will guide them to the Washington State Archives, a more-responsible home for the greater Works Progress Administration collection. Born in 1938, I was quickly indoctrinated into hamburger hysteria. With the need for cheap food, the “National Hamburger Diet” got off the grill during the Depression, and it kept frying during World War II, when many families used their food coupons almost entirely for hamburger. Standing in the kitchen with our mother, my older brother David and I were a devoted duet pleading for hamburgers, but not for their weak substitute, mere ground beef. We very much wanted the sandwich with the buns. When the Silver Inn was built and first opened by Joe and Minnie Barmon in the early 1930s, the neighborhood was freshly scraped free of what remained of Denny Hill — 18 years after its regrade stalled, in 1911, at Fifth Avenue. The new digging in 1929 was inadvertently synchronized with the Great Depression. The Barmons’ nifty boxlike cafe was one of the few structures built above the blocks of graded dirt left by the regrade. 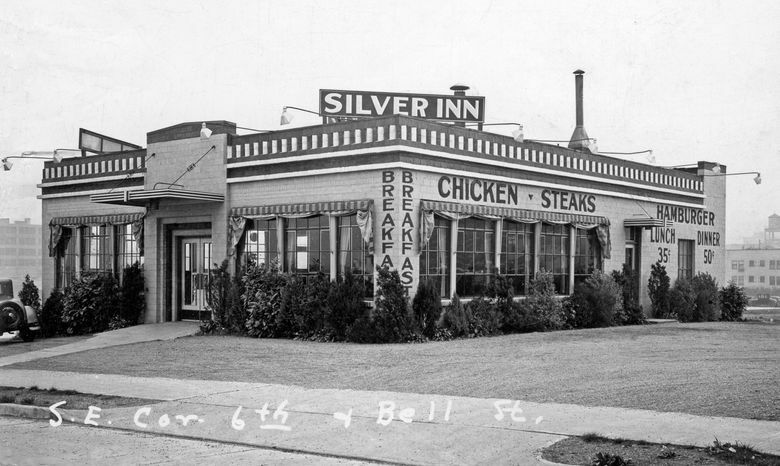 Soon after opening, the Silver Inn was shaken by an unclaimed bomb that exploded on Bell Street. Thereafter, the couple endured several overnight robberies, and gave up in the spring of 1939, when a beer and wine violation moved the state liquor board to cancel their license. Wells was not thrilled when, in 1943, the Army Corps of Engineers surrounded the school with barracks for homeless workers, newly arrived in Seattle from the Midwest. All were looking for work, expecting it, and finding it at Boeing and in the shipyards. My second-oldest brother, Norman, was among them. Ted, the eldest, was far away, aboard a destroyer in the Pacific.